806 Henry VIII (1509-1547), Head of the Church, restitutional silver medal or `so-called` pattern crown, c. 1545, Obverse: crowned bust virtually full-face, holding sword and orb, Reverse: crowned arms with lion and dragon supporters, HR monogram below, ANGLICE.Z HIBENICE:ECCLESIE: SVPREMVM: CAPVT, 43mm (cf MI 47/43). VF and rare. Medallic Illustrations states `…the unsatisfactory nature of the workmanship renders it probable that it is a copy, made in the present (ie 19th) century on the Continent…`, however H. E. Pagan (BNJ 40, 1971, "Mr. Emery`s Mint"), writing of these pieces states they "could very well be products of the Emery mint"
980 Victoria Diamond Jubilee 1897 Medal, official Royal Mint issue, silver, 56mm. (Eimer 1733). St.Gabriel's Church, Pimlico Diamond Jubilee Medal, bronze, 78mm., GVF. (2). 865 Buildings (4), Abbey Church Bath by Carter, Birmingham (2) bronze & golded white metal, 50mm., Clifton suspension bridge opened 1864, by J. Moore, white metal, 45mm. Royal Exchange London opened 1844, rev. Wellington Statue, white metal, 38mm., edge knock. Good fine or better (4). 957 Religious medals, most commemorating churches & cathedrals (14), bronze & white metal. Generally GVF. (14). 1320 Churches and Cathedrals (19), 19th & 20th C. issues in w/m, bronze & silver. 1360 Religion related medals (20) includes Baptist Union 20th Century Fund, w/m., Church Missionary Society Centenary 1899, w/m., Catholic Emancipation Centenary of Cardiff, bronze, Myers Coverdale, Bishop of Exeter, publication of First English Bible 1535-1835 w/m. (2), English Bible Tercentenary 1835, w/m., London Missionary Society Centenary 1895, bronze; Robert Raikes Sunday School medals (9), Sunday School Centenary, Wales 1885, w/m., Wesleyan Methodist medals (3). Generally VF. (20). 1899 Royal Veterinary College Collegiate Medal, clinical Prize 1922, bronze, in case. Church of Scotland Training College Aberdeen, Joseph Ogilvie Medal, bronze, in case. Heriot - Watt College Edinburgh Prize Medal 1909-10, bronze, in case. German Gymnastic Society London, prize medal 1904, bronze. Netherlands, Liberation Medal 5th May 1945, bronze. Generally EF (5). 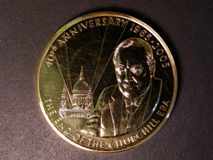 1027 Assorted silver medals (10) including Sir Christopher Wren by Pinches, Sir Winston Churchill, Queen Mother 1990 (2), Silver Jubilee 1977 (2), 25th Anniversary of Coronation 1978, Margaret Thatcher, Royal Wedding 1986. Together with a Maundy Money set 1936. In cases of issue EF. 620 Royalty related medallets/counters (8) in brass or copper, around 24mm dia., includes coronation 1702 by Croker (Eimer 391), The Church Preserved 1714, Coronation 1761, Caroline Marriage 1768, Louis Restored 1814 this pierced, Death of Geo.III 1820, Geo.IV Coronation 1821, William IV Coronation 1831. Generally GVF or better.